Stand-up paddling (SUP) is a great way to explore Portland harbor and have fun on the water. Each of our guided SUP tours begins with a brief lesson and is led by a licensed Maine guide. No prior experience is required. HOW TO BOOK A TRIP: Click on the blue buttons below or call 207-370-9730. Choose between paying upfront or putting down a 25% deposit. Click here for our cancellation policy. 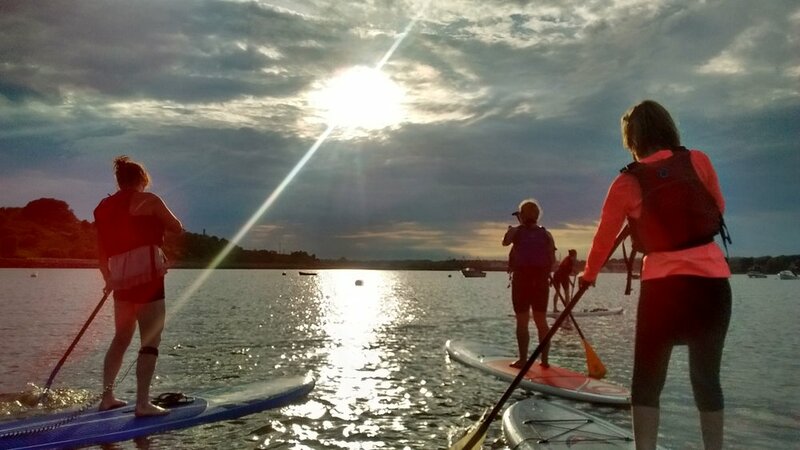 The hour just before sunset is the best time to paddle the waters of Casco Bay. The light is beautiful, the harbor is less busy and the seas tend to be calmer, often creating ideal conditions for SUP. It's also a great time to spot wildlife like seals and loons. Your tour will start off with a quick SUP lesson. Then your licensed Maine Guide will lead you on a leisurely paddle along the Portland waterfront. As you venture onto the open waters of the bay you'll enjoy a panoramic view of the sun setting over the city as you paddle back to the beach. This roughly 2-hour trip is perfect for all skill levels -- including first-time paddleboarders. Be prepared to get wet -- you'll certainly get a little damp and it's always possible you'll lose your balance and slip into the water for a quick dip. We'll provide a dry bag in case you want to bring along a camera, a snack or an extra layer to keep warm. This tour takes a route along the scenic waterfront of Portland harbor, giving you views of rugged islands, beautiful lighthouses and historic forts. We often spot seals and we always view a variety of marine birds. .Your tour will start off with a quick SUP lesson. Then your licensed Maine Guide will lead you on a leisurely paddle along the Portland waterfront, pointing out interesting sights along the way, including lighthouses, lobsterboats and 19th-century forts. This is a great trip for anyone who'd like to get a taste of exploring the Maine coast by SUP. It's also a good way to get a unique view of Portland harbor from the water. Be prepared to get wet -- you'll certainly get a little damp and it's always possible you'll lose your balance and slip into the water for a quick dip. We'll provide a dry bag in case you want to bring along a camera, a snack or an extra layer to keep warm. The silence and darkness that envelopes Casco Bay at night can be incredibly peaceful. But there's also plenty to look at: The stars overhead, the sparkling waters below and the lights of the Portland skyline and lighthouses in the distance. This tour offers a chance to see an entirely different side of Portland harbor when a full moon lights up the bay. Your guide will start your tour off with a brief paddling lesson and safety talk before leading you past rocky Fish Point and towards Portland harbor. Then you'll glide through the darkening waters looking out for seals and bioluminescence as you make your way back to the mainland. The group will stick close together, keeping track of each other with the help of flashlights. Email us at portlandpaddle@gmail.com or call us at 207-370-9730 to inquire about rates and scheduling. We understand that you may need to cancel your reservation if your plans change. As long as you give us 48 hours advance notice, we will offer a full refund on any amount that you have paid (with the exception of multi-day trips and private group trips, which must be canceled 14 days in advance for a full refund). If you need to cancel within 48 hours of a reservation we generally cannot offer any refund, though it may be possible to reschedule your booking for another day.